Guangzhou?? 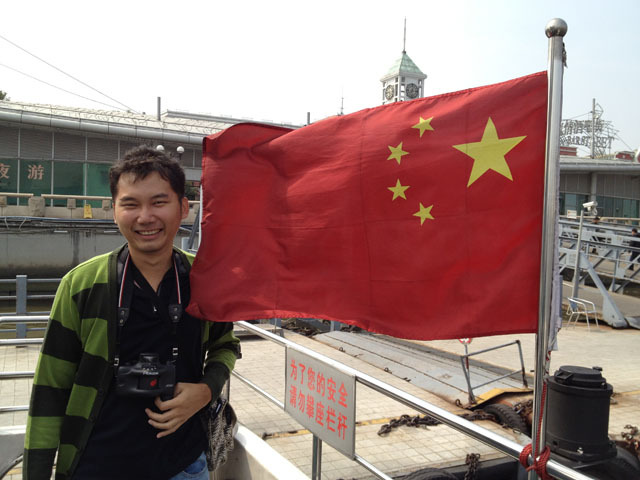 Yeap … This was my first trip to China, and only visited 2 cities in a very short trip, which were Guangzhou and Guilin. It’s a 4D/3N trip. And guess what, I bought the ticket last year haha. Last year plan was like 3 friends from Jakarta + 1 from Medan, but at the end, only 1 friend from Jakarta + 1 from Medan (+2 of his friends). Anyway, we used AirAsia to fly us to China. All itinerary already prepared by my friend, Firman! So that’s why, my friend from Medan, Ivren, who joined Hospitality Club, contacted someone in Guangzhou so this person could guide us. After waited for hours in LCCT, finally our plane to Guangzhou was ready, and we’re ready for China!! Hooray! The flight to Guangzhou took about 3 hours, and the first thing we did after we reached at the airport (the name is Baiyunport) was … TAKING PHOTOS EVERYWHERE! So just to let everyone knows that we’re in China yo! 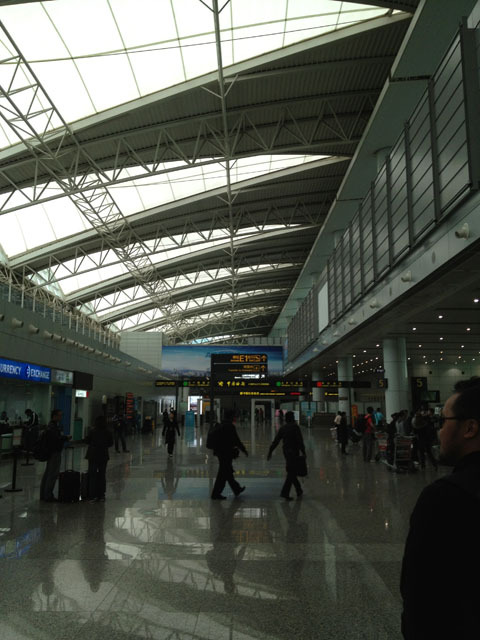 ~ They hosted the Asian Games in 2010, so they still use that in some ads boards in the airport. With the itinerary that Firman has made, we needed to go our hostel first by subway (Metro), and the subway station is inside the airport. 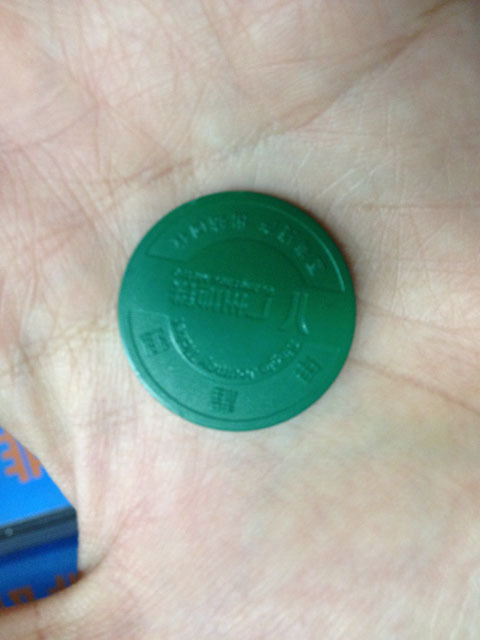 The subway is just like MRT in Singapore, but the unique thing is the subway ticket. Usually the shape is like a card, a rectangle card; but this one, the shape is like a coin. Yeap, that’s true! I was pretty scared that it got mixed up with the real coin haha! It has the same function with the regular card. To enter the subway, you just bring the coin closer to the sensor at ticket gate. After you reach your destination and want to get out from the station, you just insert the coin at the ticket gate. Actually, in the beginning, there’re only 2 lines in the Metro, but now they have 8 lines!! Amazing! So from the Airport South Station, we stopped at Guangzhou East Railway station (this is line 3), and we changed to line 1 and stopped at Fangcun. We stayed in Riverside YHA (Youth Hostel Association). As what it stated in the name, the location is in the riverside of Pearl River. 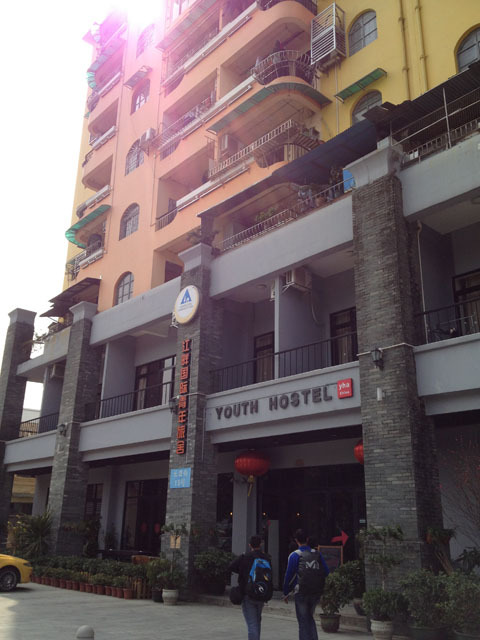 The hostel location is quite near with the subway station. It’s a walking distance to the hostel. It’s really comfortable walking in this area. The road itself is quite big, I guess it can fit to 3 cars! Although the road is big, but there’re not many cars on the street at that time. Looking at the Riverside YHA building, it’s nice and clean. Entering the lobby, there’s a receptionist, a cafe, some couch. We ordered a room with 6 beds, so there’s one more person that joined with us in the room (it turned out that one person is from Indonesia too :D). We just refreshed ourselves quickly, because there’re already 3 people that Ivren met in Hospitality Club who waiting for us. They would bring us around the city. First we went to the other side of the river to have lunch. We crossed the river by boat, because it’s quite far if we walked. 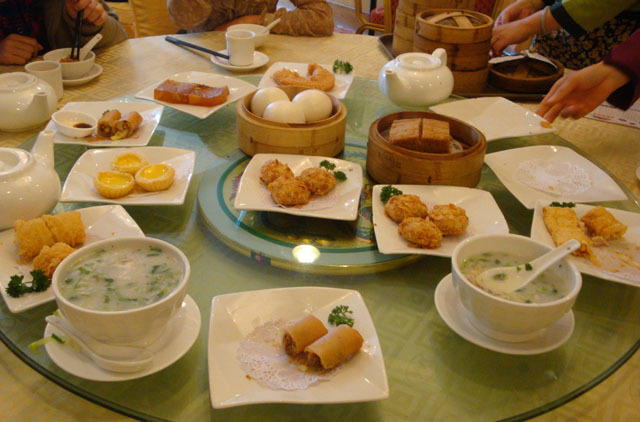 The restaurant is called Dan Ton restaurant in Aiqun Mansion (Aiqun Hotel). The place is quite unique. In the restaurant floor, there are many rooms, just like in the hotel. Then they put tables inside the room, and also in the alley. So it’s not like regular restaurant with just one big room with tables. There’re a few room. We ordered quite a lot of food for lunch, but the food was in a small portion, and we shared the food. From egg tart, dumpling, some bun, and some more food that I don’t know the name 😛 . After the lunch, we used a bus to our next destination. It’s good that we went out with the girls, so we didn’t get lost in the city. 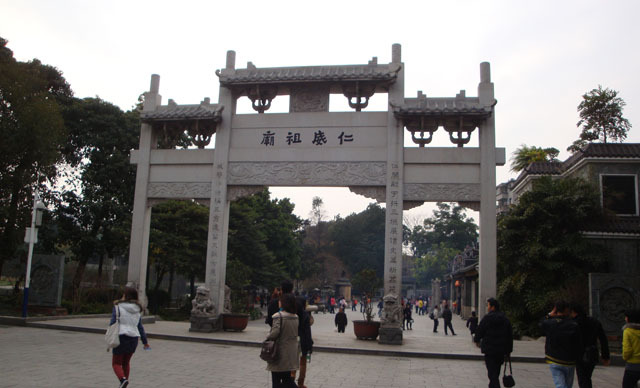 Guangzhou is a city, with buildings, and malls; but they also have temples, monument, parks, and so on. The first destination was Renwei temple. 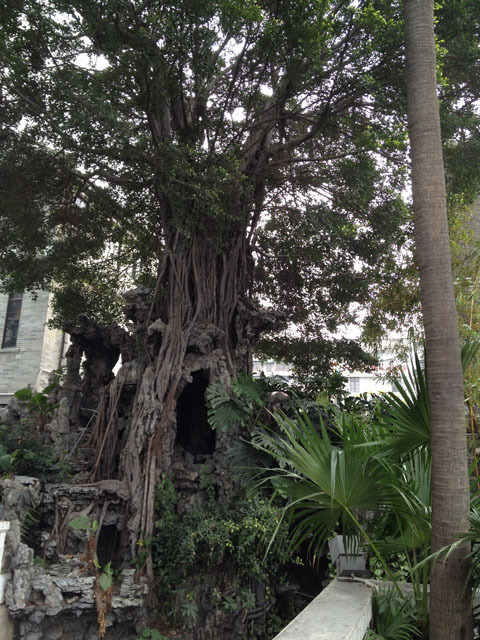 It’s a Taoist temple, and was built in 1052AD (that’s long time ago!!). It is said that the temple has three courtyards: left, middle, and right one, where each courtyards has four houses. To connect the courtyards, they have the corridors. 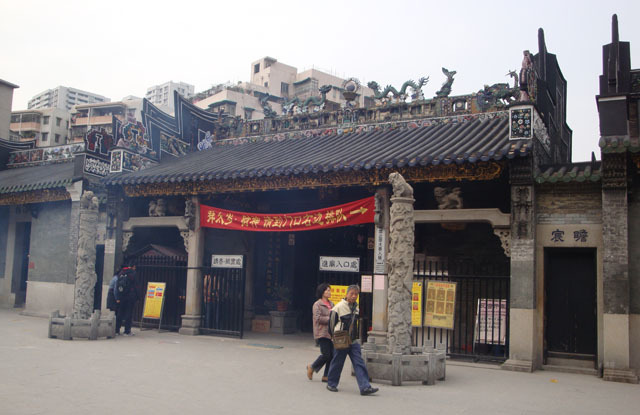 This temple is also famous with its carving, from wood to bold stone carving. Walking to the next destination, I could see the life of the people in Guangzhou. Even some of them are still using bicycle, I mean the old style bicycle. Also I could see some of the apartment buildings there. Then we reached the Xiguan residency. 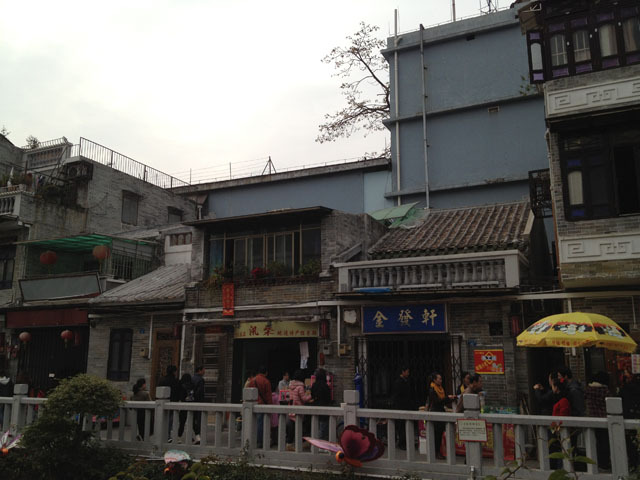 Most of the house in Xiguan residency are the shop house. First floor is to greet the guest, or function as a shop. Then the second floor is the place where they live. 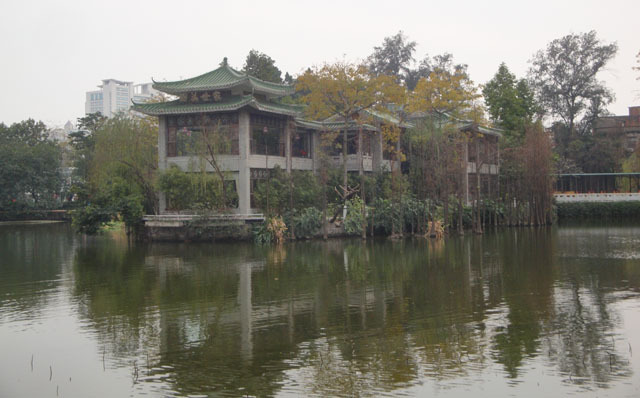 This area is crossed by the river (which is from the Pearl river), and there’s also some small lake, and one of them is called Liwan Lake. It’s really nice to just walk there and enjoy the scenery. In that area, there’s a museum called Liwan museum. 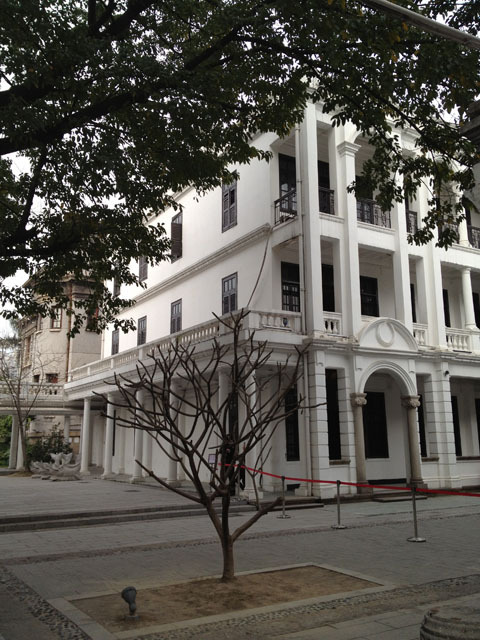 The building was previously the house of Mr. Chen Lianzhong, a comprador in HSBC at the Guangzhou cultural relic in 1993. 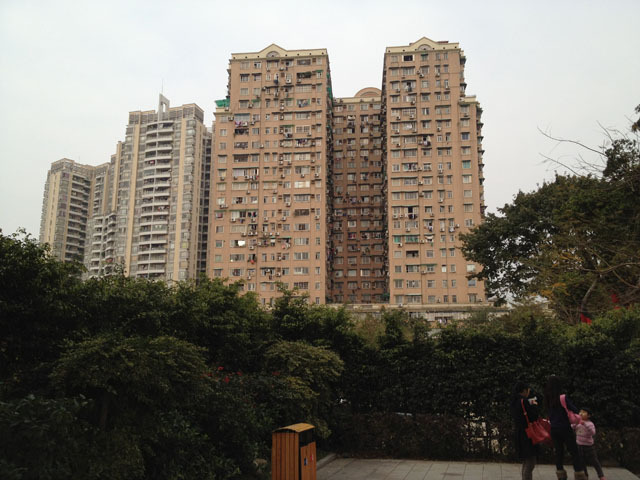 The building style is more to Western style. We didn’t enter the museum, but it said that there’s many precious articles that shows the cultural prosperity of old Xiguan. Next destination was the Sun Yat Sen Memorial Hall. A bus ride was needed to reach this place from Xiguan residency. 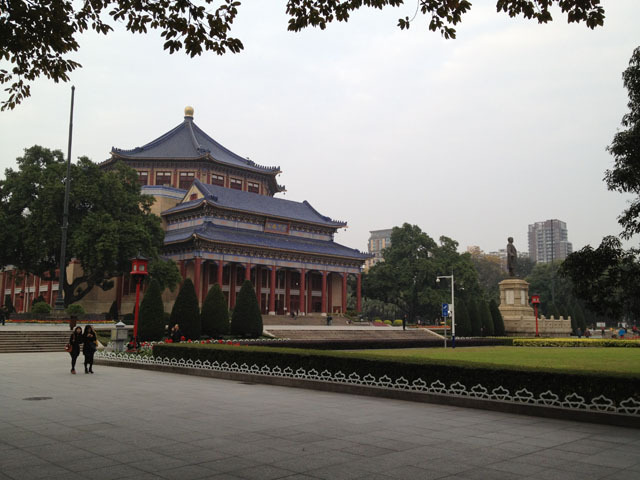 Sun Yat Sen Memorial Hall is a huge complex! From across the street I already could see how huge it is! There’s a park in the front side of the complex, a Sun Yat Sen statue in the centre of the complex, plus there’s a huge building behind the statue, which is a museum. We didn’t enter the museum as it’s already in the afternoon, and we still needed to visit other place before evening. 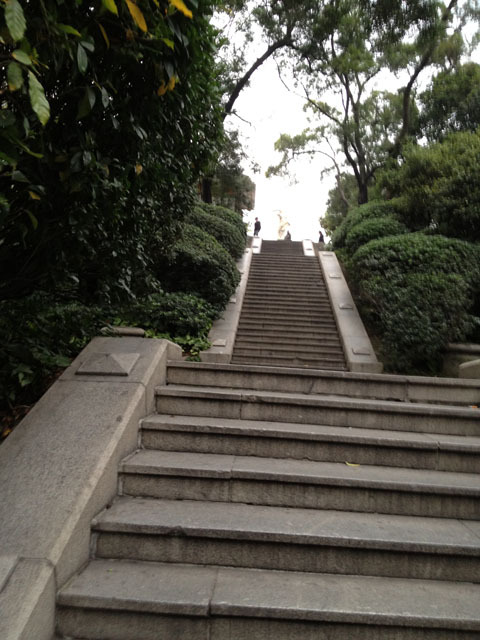 Behind the Sun Yat Sen Memorial Hall, there’s a park on a hill, called Yuexiu Park. We wanted to see the five goat statue or five ram statue in the park. Goat statue? Yes, you’re right, there’s a story behind the goat statue. In the past, Guangzhou was a very dry land which caused famine in the city. So the people prayed for the gods, and the pray was heard by the gods. Then the gods rode five goats and came down to Guangzhou, and blessed the city. That’s why Guangzhou also known as The City of Goats. 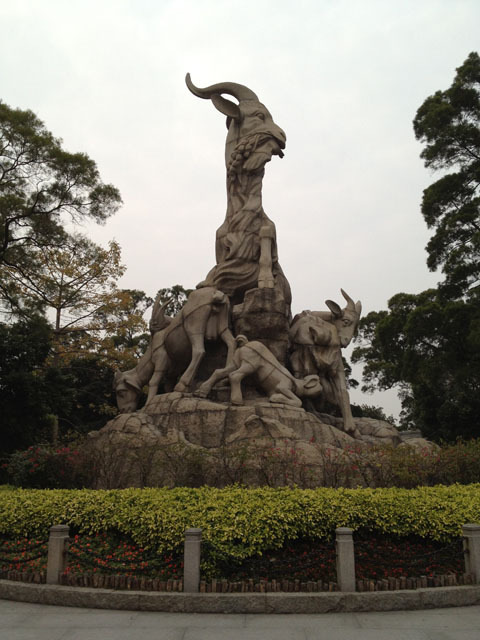 Actually Yuexiu Park is also a really big complex, there’re plenty things to see here, but because it’s already almost evening, we only had a chance to visit this Five Goat statue. (But Firman said ‘never mind, we’ll visit this place tomorrow morning.’ Lol :D). For more photos, please go to my Flickr Page. 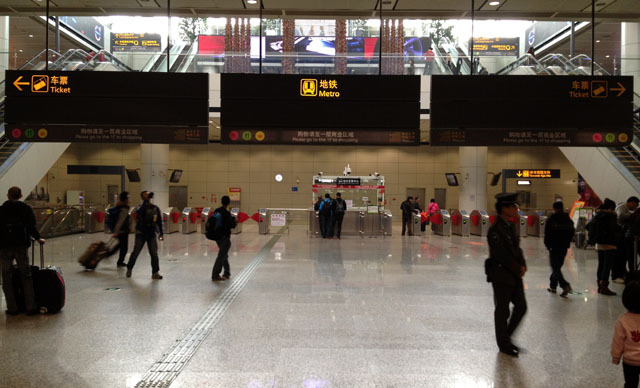 Hi, I would like to know if I can buy the train ticket from Guangzhou to Guilin in advance? How? which website? Thanks in advance. I read in TA that we could buy the ticket in advance, you might want to check the forum >> http://bit.ly/IdpEwv .